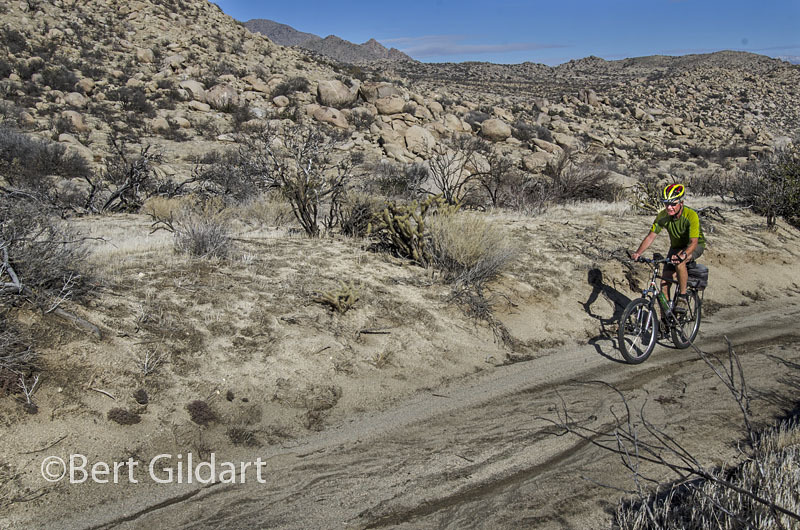 ©Bert Gildart: Several days ago a friend and I coerced our significant others to help with logistics for an incredible bicycle ride in Anza Borrego Desert State Park. Loading bikes in the back of a pickup, we drove up Montezuma Grade, and that’s where we began our biking adventure, riding into Culp Valley over a sand- and rock-covered road. The day before it had snowed, and we were surrounded by peaks that sparkled white. Yes, this was all part of the Sonoran Desert, and we had been lured by the prospect of seeing great beauty and possibly Indian morteros. Once, the Kumeyaay Indians had lived here in concert with the land. My companion was Gareth Pritchard, a man I met last year while biking the Ajo Mountain Loop Road in Organ Pipe National Monument. Gareth was from Wales, but immigrated to Canada where he worked in the business of hotel management. We have stayed in touch. After a three tortuous-mile ascent Gareth and I prepare to descend. Just turn the bike around. 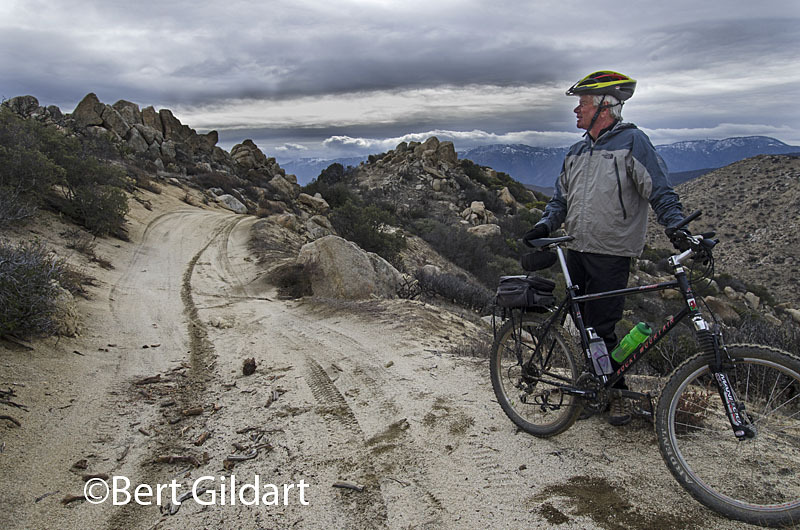 We visited about those interests as we rode, but soon settled into the challenge of the ride, which began with a steep climb that continued for about three miles. The ride then plummeted toward Grapevine Canyon. 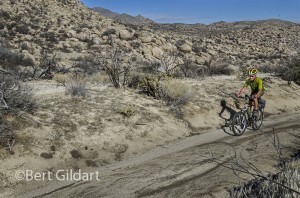 into a substance — later used to make bread, route to summit. We dismounted and spent about an hour exploring the area, then continued on to our terminus, again checking our Garmins. 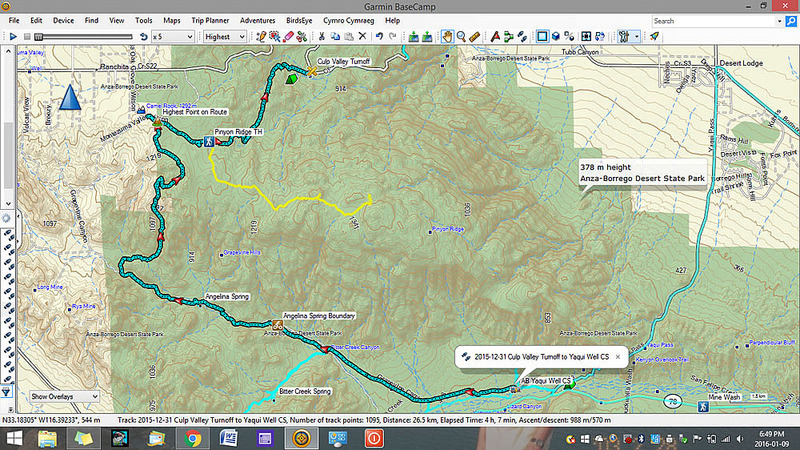 Data revealed that from Culp Valley to Tamarisk (where Janie picked me up five hours later) we had biked 15.98 miles. Average moving speed was 6.12 miles (we stopped lots) and average temperature was 53.5. 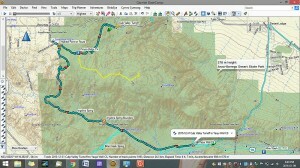 The route, according to our devices revealed we had climbed 1,706 feet then plummeted 3,156 feet. During our entire trip we saw but few others. We encountered a very considerate couple driving a jeep, and off in the distance we saw three other bike riders. Our trip was truly an adventure, and I hope that my post will turn people on to the joys of mountain biking and to the idea that we really need to preserve and protect such magnificent lands. 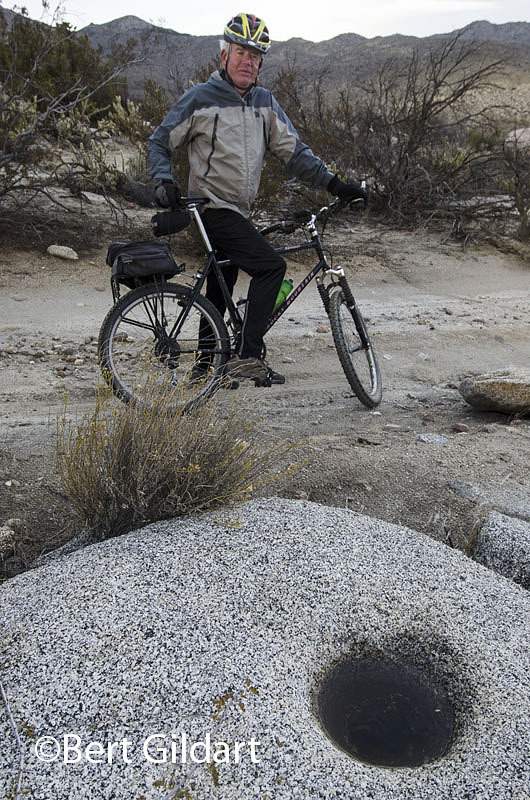 This entry was posted on Saturday, January 16th, 2016 at 8:25 pm and is filed under Anza-Borrego, Biking. You can follow any responses to this entry through the RSS 2.0 feed. You can leave a response, or trackback from your own site. Great posting Bert. It looks like you and Gaerth are companieros simpatico’. It didn’t look like you had your “Fat Tire” with you, ….or did you all ready drink it?